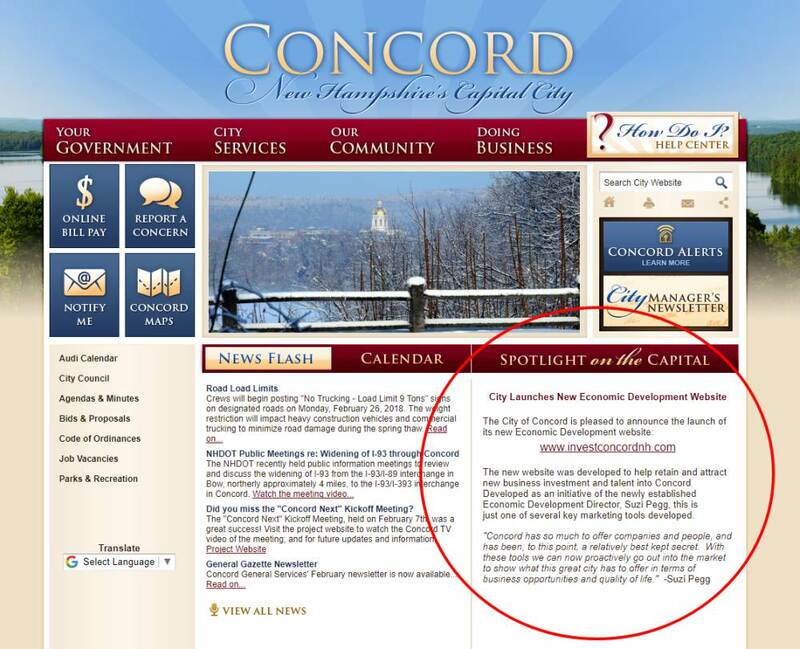 This month another great city government website attracting business investment went live in Concord, New Hampshire. 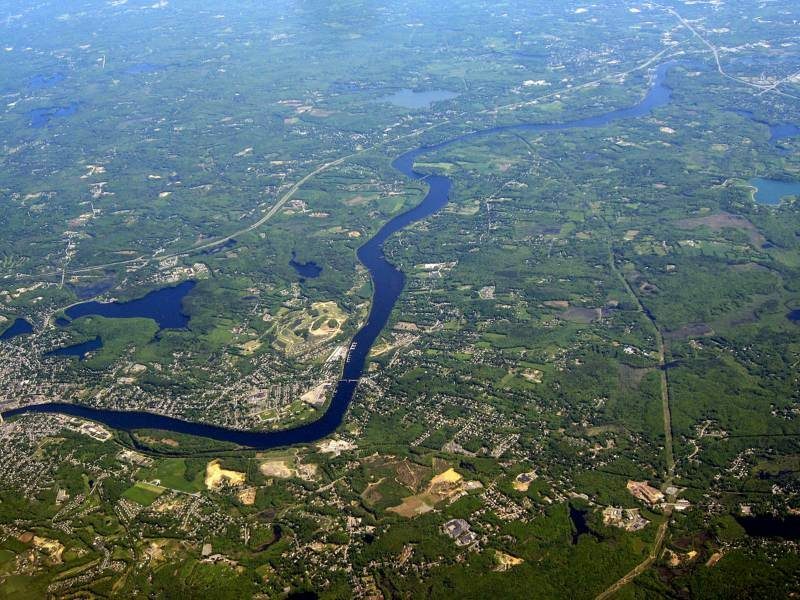 There must be something in the water of Merrimack Valley as within a short period of time both Concord and Haverhill, Massachusetts have launched websites aimed at economic development. 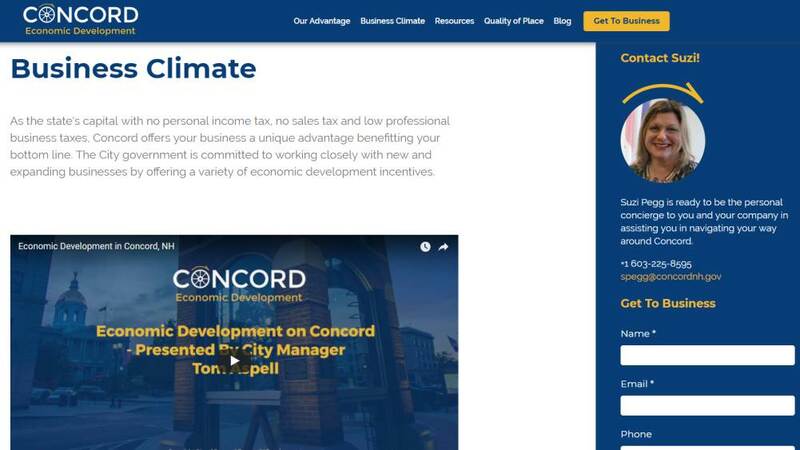 Invest Concord’s site uses great design and user experience to position the capital city of New Hampshire as an attractive destination. It’s not perfect, but like my analysis of Haverhill for an initial product it has many great things that senior executives can learn from and apply to their digital offering. One thing I need to mention upfront that like Haverhill, Concord is a relatively small city of 43,000 so it doesn’t have the same level of resources to draw from as say the City of Long Beach or Minneapolis at ten times the population. So comparing it wouldn’t be fair. Based on your city government size you should look at what they have to offer and how they can help your digital government strategy. Concord’s economic development director, Suzi Pegg, has clearly delivered against a positive vision of the city for businesses. It funnels and case manages all interactions with interested businesses through to her. From this perspective the strategy uses the digital channel as the carrot to raise awareness of the city to businesses, before strongly hooking them in to contact Suzi. The website clearly positions her as Concord’s personal concierge to business. Like Haverhill all her contact details are out there: phone number, email and social media channels. This type of hands-on business development is something that should be applauded. In the digital word of reducing “avoidable contact”, smaller cities are seeing the value in building strong relationships with business from the start. And it makes a lot of sense. Sure the cost of a full time salaried staff member, or members costs money. But provided they deliver the goods and attract new businesses to the city, creating jobs and growing the local economy and community, the ROI speaks volumes itself. And this is far more likely to be achieved in a climate of a compelling customer position in the digital space. It moves beyond marketing spin and promotion or waiting for businesses to do all the legwork and stumble on your city. The contemporary look and feel of the Invest Concord site is fantastic. It really pops and draws you in. It doesn’t feel very “government-y” but based on its core messaging its clearly run and managed by the city, giving it authority. It builds on this further with using social proof throughout the site. Whether that is the logos of businesses based in the city, awards won or key statistics re-assuring the reader about its economic performance and quality of life, Concord is positioned as the ideal location for your business. The website also includes two really positive and engaging Youtube videos from business owners who have moved themselves and their businesses to Concord. This again adds social proof and re-assures visitors to the site that the city is a great fit for their needs. Two really smart things Concord achieves in targeting their audience is appealing to both the head and the heart of business owners looking at relocating. I mentioned this above with statistics, but it goes beyond that. Whether it’s subtly dropping into Youtube conversation about the lack of sales and income taxes in New Hampshire, highlighting local building projects or its highly skilled workforce, Concord is clearly appealing to business owners’ heads. But it compliments this with a strong focus on heart. Messaging revolves around bringing up families, green spaces and recreational facilities. At no stage does Concord try to position itself as trying to appeal to all American businesses. They’re actually pretty targeted with one Youtube video opening with a busy Boston skyline criss-crossed by highways, crowded sidewalks and sirens before following the I-93 leads to an idyllic experience of a young child running to his mother by a stream bank, wooded hills and calming music. Well crafted copy across the site adds to the video, clearly targeting busy Bostonian business owners looking for a change. In addition the audience is targeted the next level down, with a growth focus on industries like technology, medical, manufacturing and distribution/logistics. The Youtube videos from city manager Tom Aspell provide just the right level of specifics without drowning in detail. The site has a good collection of video content discusses in 2 to 3 minutes bite size chunks, key projects recently completed or occuring in Concord. This gives business owners looking at relocating a solid foundation in new and regenerated infrastructure that could support their endeavors. It doesn’t matter whether we’re talking about Concord, Haverhill, Long Beach or Minneapolis. City governments across America are adopting innovative digital strategies and rolling out rapid customer-focused results. They are consistently leading the way in getting a much improved offering up and running based around a business customer centric model. And unfortunately the states and national websites are playing a slower game of catch up. The great thing about the model they are adopting is recognising it doesn’t have to be perfect from Day 1. It just needs to be a significant step-change up from where they have stably sat. From there the secret is iterative improvement. A hearty back-slap for launching is justified, but you can’t rest on your laurels. Its absolutely necessary to quickly move up another level. Long Beach is well and truly doing this, and I know Haverhill are planning the same. I covered both off in recent podcast interviews with their economic development directors that I hope to share with you very soon. So what next steps can Invest Concord take? With a new government website there’s always going to be areas to come back and fix post-launch. So what can Concord do next to keep the ball rolling? One of Concord’s strengths is also its strongest weaknesses. By concentrating all contact to an individual - albeit one with authority to act - it reduces the online visibility and ability to attract businesses to Concord. The site teases business owners with some details about incentives and growth industries in the area. These should really be built out further, not only to provide a broader and more holistic customer experience, but also in providing a greater range of content for search engine optimization. For example, each of the five targeted industries should at least be expanded into their own pages, providing social proof and testimonials from other successful Concord businesses in that industry- especially if they have relocated from the target market of Boston. Plus including information about current projects and incentives relevant for that industry type would help round out a more customer-centric offering that would resonate with the archetypal desired business owner. By finding that “sweet spot” between the right depth of content without drowning the business owner, Concord can also more effectively raise its awareness. This not only means business owners will be more likely to contact the city’s economic development director they’ll also be more engaged. I’d be keen to understand what are Concord’s success criteria and performance measures as this could help explain the strategy adopted. As I’ve touched on already Concord does this well, but there is still some small tweaks that can be met to raise their game further. The testimonial videos tend to be randomly buried on the site when they could be more logically positioned. They are currently mashed into the site’s projects page and “quality of place” page when they could be better integrated together. That said, that would not preclude using them on the “quality of place” page where it often makes sense in the customer journey, or even link to them from this page. In addition to deepening the content offering some logical connections can be made. For example the videos throughout the site have a title to give the business owner an idea of what its about, but a couple of sentences to give a high level summary would help. This not only helps round out the customer experience, but again provides Google with more context about the page, improving the site’s SEO. Another improvement area for the videos would be including overlaid summary text to reinforce key messages. Haverhill’s videos did this really well, and it wouldn’t be difficult for Concord to post-edit them and upload updated videos. In addition to improvements in deepening the content offering and videos, there are two other value-adds that Concord should consider. A diagnostic tool to help businesses triage what incentives and other government support would be a great step forward. By answering a few simple questions this would quickly pre-qualify their business. Instantly this sends a positive message that Concord and the State of New Hampshire are pro-business and actively want growing businesses to relocate. Supporting this would be using project and development opportunity overlays on top of Google Maps. This could also help with highlighting growth and transport corridors beyond the fine entry level stylistic map used on the site. Concord’s biggest slip-ups is one made unfortunately all too often by city and state governments: forgetting the power of their .GOV domain name. There seems to be a tendency to assume that businesses won’t willingly go to a government economic development site. All too often they’re masked under a .COM domain and often create their own brand identity rather than reinforce the existing government brand or seal. 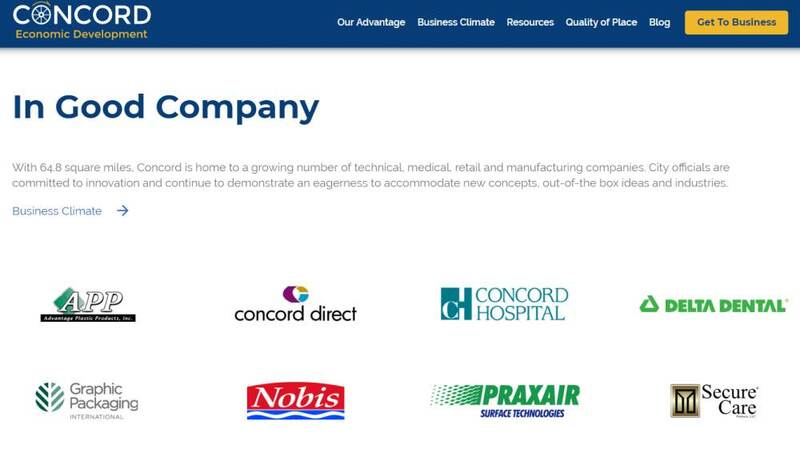 On the latter, Concord doesn’t proactively use its brand or seal on its main government site so this is less of an issue. But the decision to avoid a .GOV domain is a significant mistake. Google simply adores .GOV domains. Nothing speaks trustworthiness in the digital landscape more than a .GOV domain. Its even more valuable than a .EDU domain. As a result going with a .GOV domain instantly gives your site a boost in search engine ranking placement. That means you’re more likely to gravitate toward the top of Google results. And when you’re trying to get your location on the radar of a business looking at relocating or expanding, this is pure gold. The only thing better is piggybacking off an existing established relevant .GOV domain. That then also plugs into domain age and corresponding history of backlinks, both additional factors in improving search rankings. Going with a brand new .COM domain (investconcordnh.com was only registered six months ago) means all those benefits are missing. Which by default then minimises the investment attraction outcomes ultimately desired. It’s not too late to fix this. As I mentioned, too many governments make this easy mistake. But acknowledging this in a project post-implementation review gives a simple face-saving way of correcting the situation. Build in a 301 server redirect on the .COM domain to a better .GOV domain and Concord can make a bigger impact on it goals. 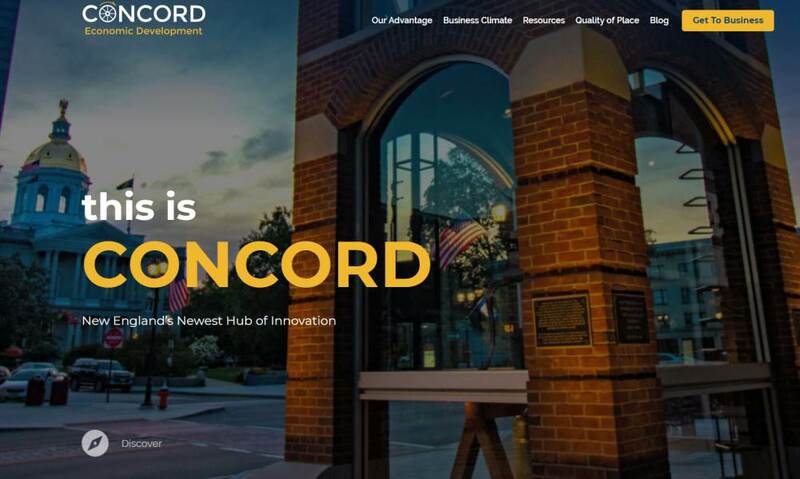 They’re already doing well with their backlinking strategy (investconcordnh.com is prominently linked from www.concordnh.gov), and building on this by reaching out to related sites like the Concord Chamber of Commerce and partnering will make a difference. Concord’s economic development brand association with having a clear go-to person in Suzi Pegg is likely to be more effective than genericizing. Afterall, it appeals to their local community positioning. However it does make Concord single-point sensitive when she goes on vacation or is sick, or if she moves onto another role elsewhere. Now none of this is unsurmountable at all. But it does require some good business continuity planning to make sure business continues to run smoothly in her absence. So what’s in this for your government? Create social credibility. This is a must for an investment attraction site, but the principles also behold well with any Government to Business site. Want to know more about how you can improve your Government to Business experience? Simply get in touch. I’ve helped out many governments worldwide with their digital offerings to business and would truly love to help you too.